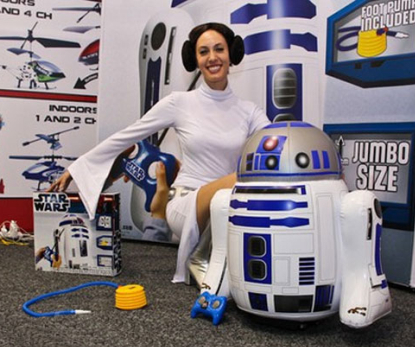 Always wanted your own Star Wars droid R2D2? For Xmas 2012, Star Wars dreams do come true! 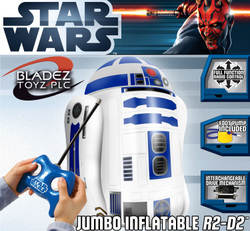 The new Star Wars Pump and Play R2D2 from Bladez is a 65cm tall, super-tough inflatable radio controlled toy. Controleld by a chunky child-freindly handset/controller, you can sent R2D2 forward, backwards, or send him in a spin on the spot! Thanks to his robust construction, nothing defeat this R2D2. Knock him voer an he'll self right in a second. Send him down steps (where no Dalek dares to tred), and he'll bounce back upright at the bottom. 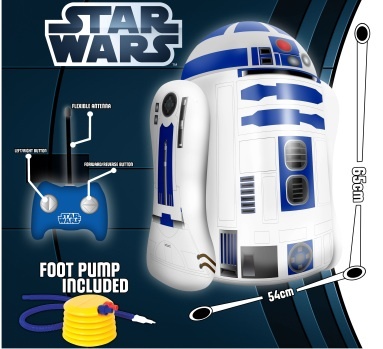 All you need to do is inflate R2D2, pop in the batteries, and save the galaxy one more time before tea! The new range of Pump and Play radio controlled Star Wars characters for 2012 will include the menacing Darth Vader, a Stormtrooper and character most green is, Yoda.